I’ve been holding my breath since mid-September, waiting for signs of life from the saffron corms I planted at this time last year. Honestly it’s been a bit of an obsession, though I have refrained from checking every hour. 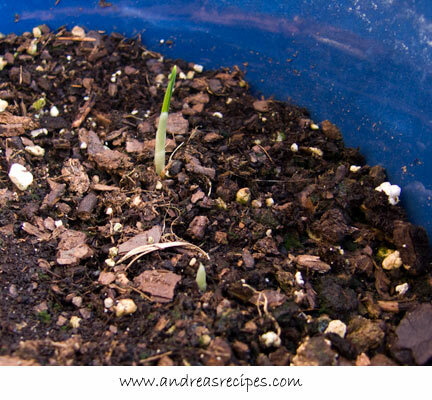 Just once a day has been enough, and yesterday I was finally rewarded when I found two little sprouts in one of the pots and one more in the other. I have not seen any saffron sprouts in the ground areas yet, but I’m still hoping and watching. A recap for those new to the experiment: I planted 50 saffron crocus (crocus sativus) corms last fall to find out if I could actually grow my own saffron. Ten corms went into pots that I kept indoors throughout the winter and moved outdoors in the spring; the rest went into the garden in an area that we didn’t plan to water much as saffron crocuses don’t tolerate wet conditions very well and the corms can rot if over watered. Every few months I’ve posted reports on the saffron’s progress, and my last report in May explained how they had lost all their leaves and slipped into dormancy for the summer. Saffron crocuses prefer cool weather, blooming in the fall and retaining their green leaves until the warm days of summer begin. Hopefully in a few weeks I’ll have photos of the beautiful flowers and a chance to harvest the red stigmas. Once that is done, I plan to do some informal taste tests to see how my homegrown saffron stacks up against purchased saffron. Yes, I just said that with a straight face. Sort of. That is so cool! I can’t wait to see how they turn out! Too cool! How many stamens will you get, though? Will 50 crocuses be enough to give you much flavor at all? Wow – not quite as easy as your “grow new scallions from the roots” trick. I have always wanted to grow both my own saffron (since it is SO expensive) and my own ginger. I will be watching and waiting to see how your experiment turns out. Hi D Wilson! No, this experiment does not have the nearly instant gratification of the scallions trick. I’ve heard that growing ginger is pretty easy, so that’s next on the agenda. I have some in the kitchen now, waiting to try. We planted crocuses in our yard. Never thought to pick the stamens for saffron. Does it have to be a certain type of saffron, or will any kind work? Oh Claire, it seems I missed the deadline. Hopefully the next one! Nate, saffron comes from one particular type of crocus, the crocus sativus, which must be planted in the fall and takes one full year before it flowers and produces the three red stigmas. Maria, that’s great! Thanks for sharing your success with us. According to an article on the Tarvand Saffron Company website, the stigmas should be harvested when the flowers are 15 to 20 days old (if I read the directions correctly). I am on my second year of harvest!!! Today I picked 18 stamens and I have more coming. Here in Ga. they are multiplying quickly and I am really excited. Does anyone know the best time to pick them? I have been picking early first day of bloom but wonder when the best flavor requiers waiting a bit longer.